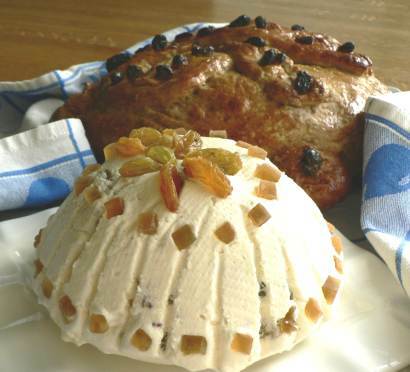 Pasha is a traditional Finnish Easter dish, especially in the eastern parts of the country. 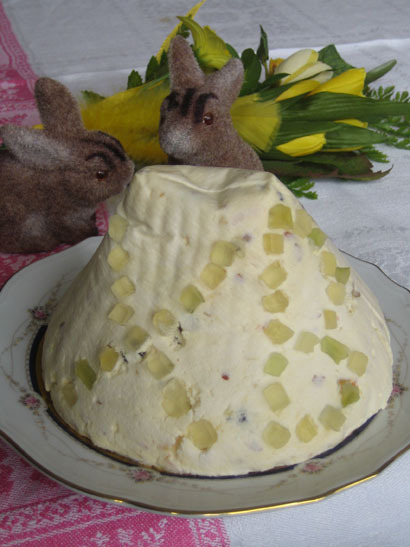 It was brought here by the Russian Orthodox church hundreds of years ago, and is eaten to celebrate the end of the lent. You may know pasha with a little different name – pascha, pashka, or something similar. Pasha or ????? is a Russian word for Easter, originally from a Hebrew word pesah. The transliteration from Cyrillic alphabets explains the small variations in the name. Traditionally pasha is made in wooden, pyramid-shaped molds. Since Easter is the biggest holy day of the Russian Orthodox church, the molds are often carved with religious symbols such as XB, short for Hristos voskrese (??????? ????????) – Christ is Risen. The pyramid shape reminds of the Jews’ slavery in Egypt. Mix sugar and butter until airy and smooth. In a separate bowl whip the cream. Add all the rest ingredients to the sugar and butter mixture, mix until smooth, and finally carefully add the whipped cream. Pour the mixture in a double-layered coffee filter, and let stand in a fridge for 24 hours.